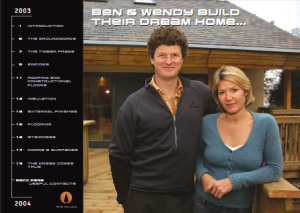 This is the story of the dream house that Ben and Wendy built. A beautiful contemporary home to bring their two children (Isabel and Freddy) up in, with lots of natural light, exciting space and stunning views. A home that will open out to the garden in the summer, but be warm and snug in the winter. That will make the least possible impact on the environment and cost next to nothing to heat, thanks to timber frame construction and first class insulation. Ben works for the environmental charity, Forum for the Future. He’s taken a 6-month sabbatical to break the back of the job. Wendy has given up her job at Green Futures magazine to work full time as project manager. As 6 months stretch into 18 months they learn the hard way how best to avoid your dream turning into a nightmare….